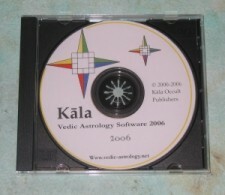 Kala boasts the most complete Muhurta Module available in any Jyotish software. 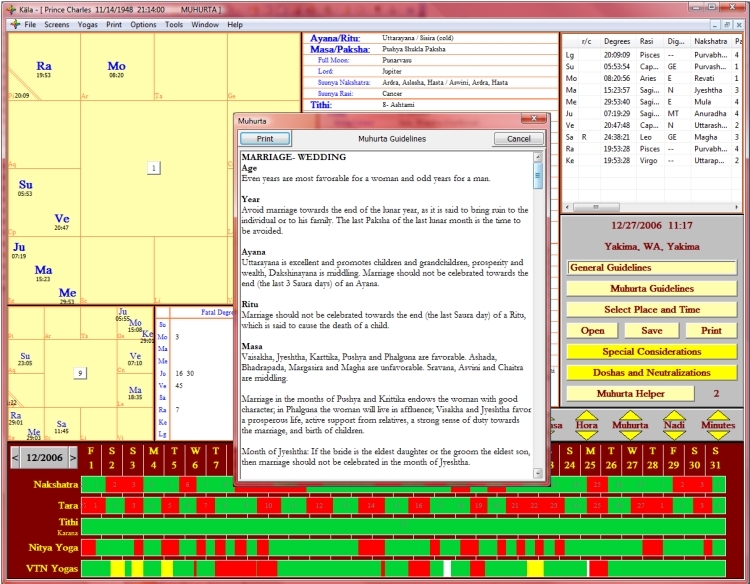 It even has more Muhurta (electional astrology) specific calculations than other Muhurta only softwares. It is the only software that has the necessary calculations to effectively find favorable Muhurtas and it is designed to help you find those good Muhurtas easily and quickly. Kala's Muhurta Module even contains a Muhurta Helper, which searches for the best Muhurtas for you. To start, there is a month long time-line at the bottom of the screen displaying the favorable and unfavorable Nakshatras, Taras, Tithis, Karanas, Nitya Yoga and Vara/Tithi/Nakshatra Yogas. Red is unfavorable, green is favorable. At a glance you can see the favorable times in the month simply by looking for the days with the most green. 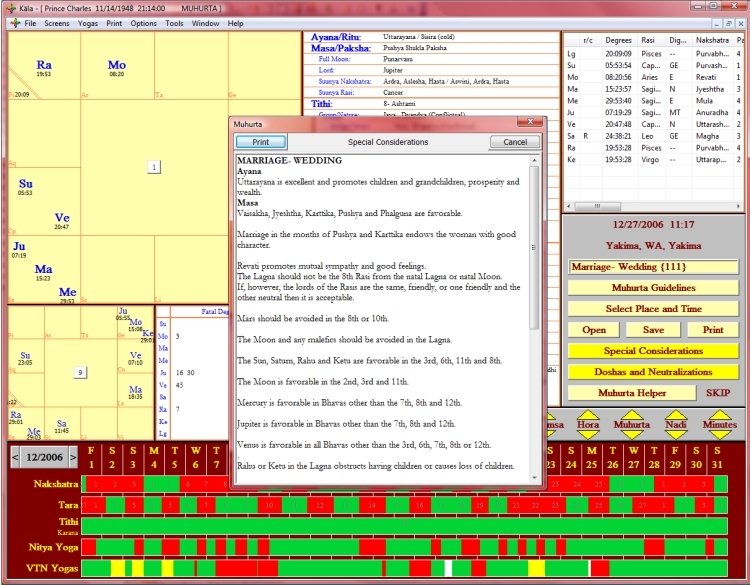 The time line is event specific, so first you select the event, such as Marriage, and then you examine the time-line. There are over 170 events, so anything you can think of finding a Muhurta for you will have the guidelines at your fingertips. Changing the time on the chart is done easily with a selection of up/down buttons as seen just above the time line. You can go up or down one Vara, one Tithi, one Nakshatra, one Karana, one Lagna, one Navamsa, one Hora, one Muhurta, one Nadi or one minute. This feature makes finding that perfect Muhurta with a good Vara, Tithi, Nakshatra, etc. so much easier and quicker. By clicking on the Muhurta Guidelines button in the control panel on the left, a window pops up with all the event specific guidelines to follow for selecting the Muhurta. The guidelines given are exact and extensive, nothing important is left out. (There are 400 pages of text in the Muhurta Module, more than in any book, so the Muhurta Module is a complete Muhurta learning tool as well). While searching for a good Muhurta, you can click on the Special Considerations button on the control panel on the left and a window pops up with any event specific good or bad points that are in the chart that you have selected. Kala actually searches the chart for any especially good or bad points relevant to the event and displays them for your consideration. Finally, after you have found a time that you think is good, you can click on the Doshas and Neutralizations button and Kala will search the chart for any of the troublesome Muhurta Doshas, or Blemishes, while also searching the chart for any factors that neutralize the Doshas and then display them for your consideration. Kala's Muhurta Module contains a Muhurta Helper - a tool that actually finds good Muhurtas for you. All you have to do is select the nature of the event, and then put the time frame into the Muhurta Helper, and the Muhurta Helper will do the rest for you can search over 120 Muhurta factors and display the favorable Muhurtas. 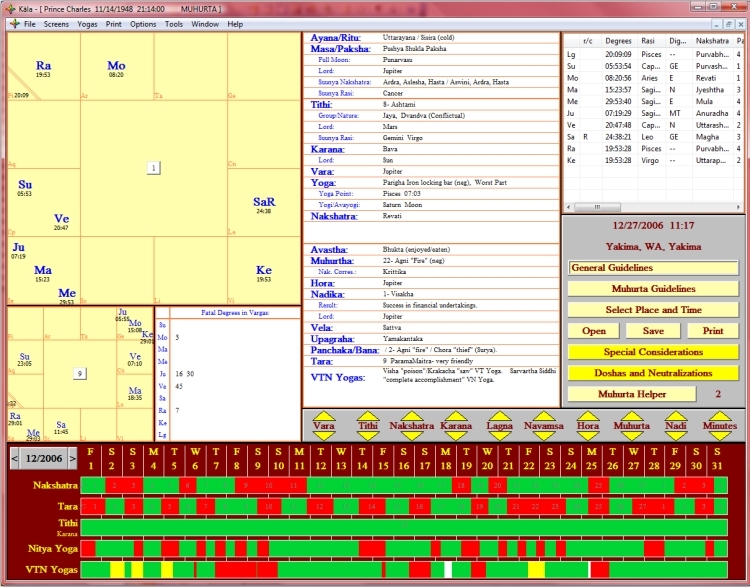 After the Muhurta Helper finds the good Muhurtas for you, you can click on the times it has given and the Muhurta chart will update to that chart and then you can study it and approve the Muhurta. The over 120 factor which are considered are completely editable as well, leaving you in control of your Muhurtas. Muhurta Helper can thus be used to find Muhurtas, or to help speed up the your search of good Muhurtas by screening the time frame. Kala's Muhurta Module is so advanced that we have had several astrologers turn to Kala just for the Muhurta Module, it just makes Muhurtas so much easier and quicker. 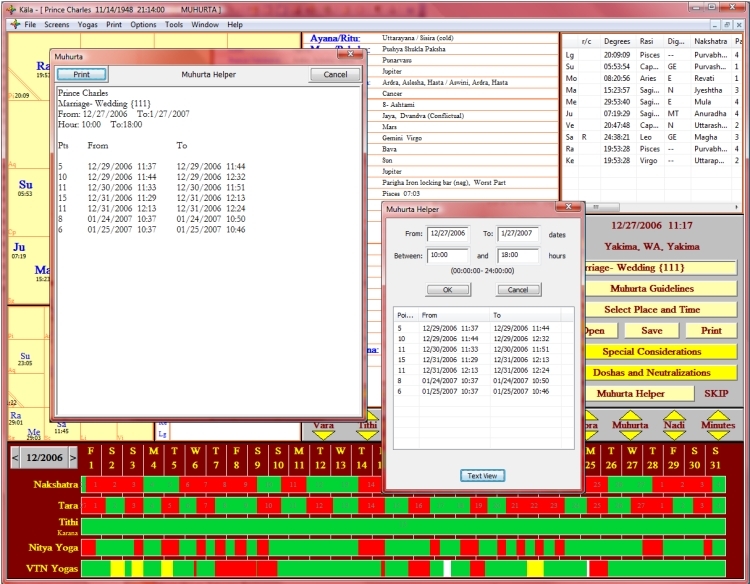 Myself, I can find a better Muhurta in 1/6th of the time as compared to when I used other softwares.